When in a jiffy, Rava Upma comes handy. This very easy to prepare breakfast/snack item is light and wonderful, can be prepared quickly; and relished nonetheless. 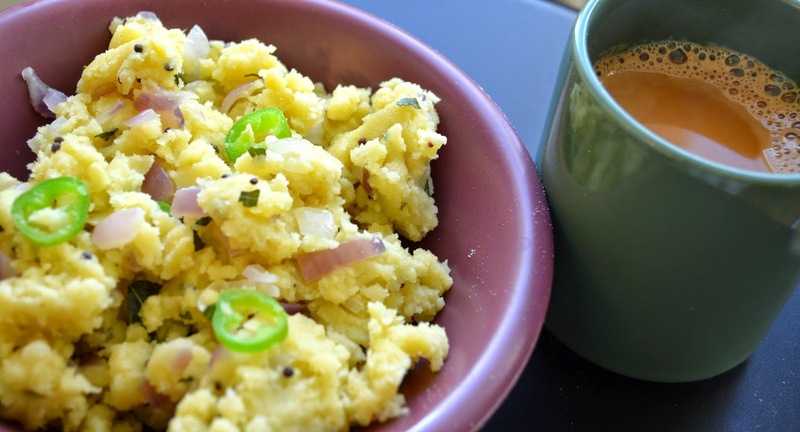 My idea of a perfect rainy evening is a bowl of hot steaming upma with a hot cup of tea.. The best thing - doesn't take mush of an effort as well..
Dry roast the semolina (sooji) on medium flame until it is hot to touch. Remove and keep aside. Heat oil on medium flame and add mustard seeds. When they splutter, add urad dal, red chilli and curry leaves. Let fry for about a minute. Add the onions and green chilli. You can also add chopped ginger here. Sauté till onions turn transparent. Add the water, add the salt and the butter/ghee, and let the water boil. When boiling, reduce flame to low and add the semolina slowly, while stirring with one hand. Do not put all together. When all the water is absorbed, mix well and let cook for about 2 minutes. Turn off the heat and serve hot.